Library image #775: Native California palm trees at Hidden Spring Oasis. The United States Congress designated the Mecca Hills Wilderness (map) in 1994 and it now has a total of 26,356 acres. All of this wilderness is located in California and is managed by the Bureau of Land Management. The Mecca Hills Wilderness is bordered by the Orocopia Mountains Wilderness to the east. Thanks to the restless San Andreas Fault, the geologic formations of Mecca Hills Wilderness are among the most unusual sites of their kind in the world. Entire regions are exposed layers of eroded rock, some over 600 million years old, and are a source of valuable information to scientists about the effects of tremors on the earth's crust. The area is a badlands labyrinth, a natural maze of small, narrow, steep canyons. Colorful Painted Canyon runs in a general north-south path through the middle of the Wilderness. Sandy washes sprinkled with ironwood, smoke trees, and paloverde divide the area, while ocotillo squat on gentler slopes and the tops of mesas. Bighorn sheep occasionally cross over from the Orocopia Mountains on the east, where they find more water. You may see spotted bats, desert tortoises, and prairie falcons. The non-Wilderness corridor of Box Canyon Road splits off a small southern section of the area in which you'll find Sheep Hole Oasis and Hidden Springs Canyon (reliable sources for water). If you look closely, you'll discover caves, known locally as grottoes. Planning to Visit the Mecca Hills Wilderness? How to follow the seven standard Leave No Trace principles differs in different parts of the country (desert vs. Rocky Mountains). 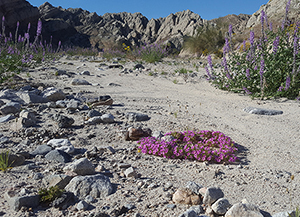 Click on any of the principles listed below to learn more about how they apply in the Mecca Hills Wilderness.